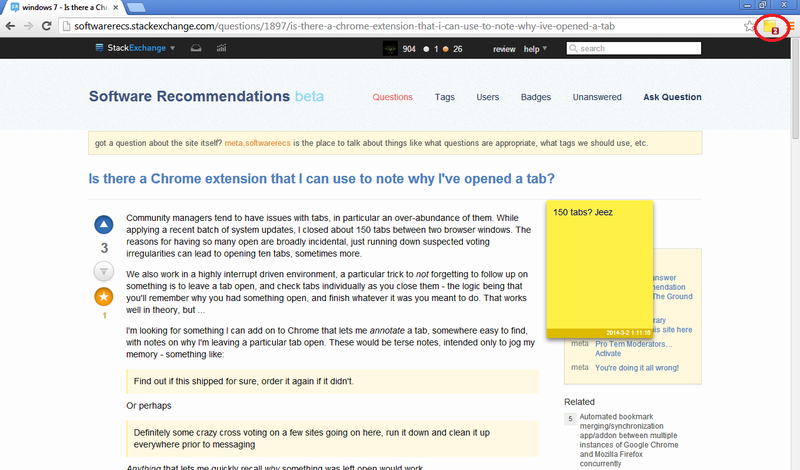 Community managers tend to have issues with tabs, in particular, an over-abundance of them. While applying a recent batch of system updates, I closed about 150 tabs between two browser windows. The reasons for having so many open are broadly incidental, just running down suspected voting irregularities can lead to opening ten tabs, sometimes more. Find out if this shipped for sure, order it again if it didn't. Anything that lets me quickly recall why something was left open would work. I'm not particular on implementation details, or the state of the extension (alpha / beta is fine with me). I don't care if it doesn't sync and only works off of local storage / etc - anything beats what I currently have which is basically nothing. Additionally, I'm not concerned about compatibility with the various mobile versions of Chrome. Windows 7 + gets the job done for me, compatibility with Linux would be swell, but not needed. Is there an extension that does this, and can help me make simply leaving tabs open a more productive tool in my workflow? Update: I published this extension here. It's a popup that one can add an annotation to. The update button updates the annotation (and closes the popup). By default, the "persist" checkbox is clicked, so the annotation is associated with tab URL, and is not cleared unless explicitly dismissed. This will sync across devices too. If the persist checkbox is not clicked, the annotation is associated with internal tab id and is cleared when the tab is closed (or the annotation is dismissed). The icon will turn yellow on pages which have annotations, for easy identification. 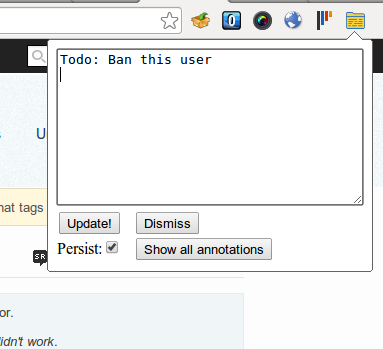 There is also a list of all annotations, accessible from the "show all annotations" button in the popup. 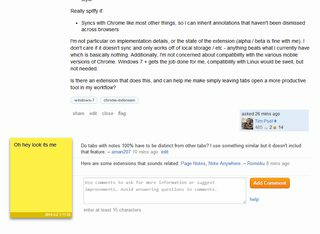 This lets you dismiss annotations from one place, and also acts like a tab-switcher with the "Go to tab" button. Sounds like Note Anywhere will do the trick for you. Although it doesn't distinguish the difference between tabs that have notes and ones that don't, it is still pretty useful. I use it on occasion when I am looking through API documentations and I forget what I am looking for. 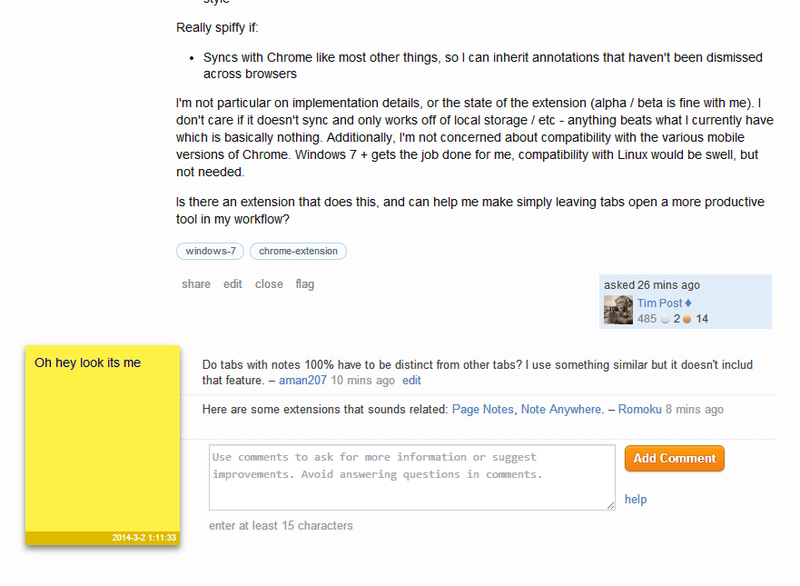 To view all the notes you have on any page, right click on the extension icon, and then select notes summary. 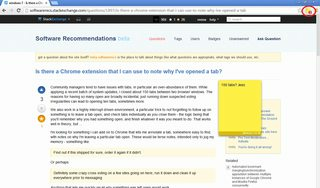 This is a work around to seeing which tabs have notes. The developer also has plans to include syncing between computer and exporting notes, in an upcoming update. Although it hasn't been updated since last June. It's not quite what you are asking for: it doesn't allow for manual writing of notes. But it may still accomplish what you need: quickly remember at a glance how you got to a certain website. And all that automatically, without having to think of a note to write. It has certainly helped me out many times when I have 100-150 tabs open. Not the answer you're looking for? Browse other questions tagged chrome note-taking or ask your own question. What can I use to keep track of my web research? 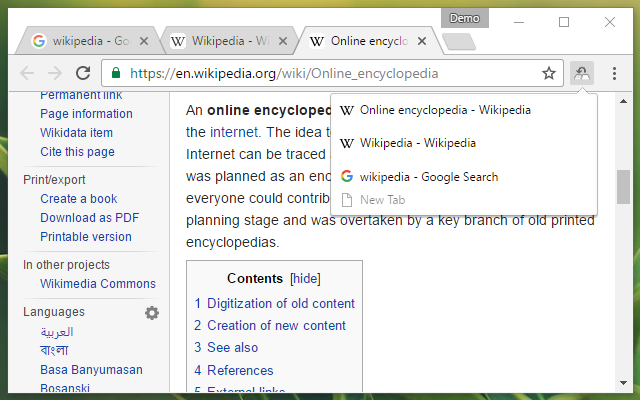 Chrome extension to mark duplicate tabs? Is there a Chrome extension that would allow me to re-focus a tab when I click on a link that is still open?